Our selection of scratching, scraping Fair Trade güiros. We stock budget Balinese bamboo items as well as our very popular range of Thai frog güiros in a mix of sizes for finding the perfect croak! 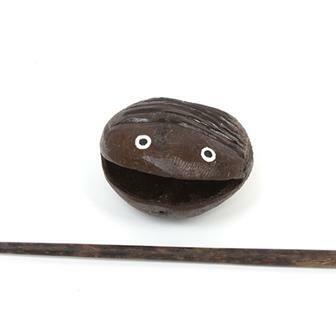 Cute Fair Trade percussion instrument. 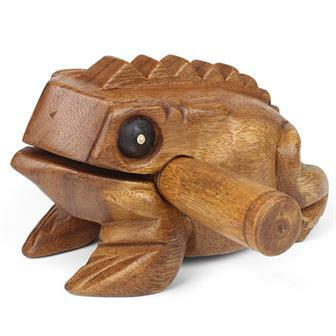 These small wood frog güiros are made from acacia wood in northern Thailand. Run the provided stick along the ridges on its back from rear to front to make it croak, or hit it on the head to make a ‘pock’ sound. 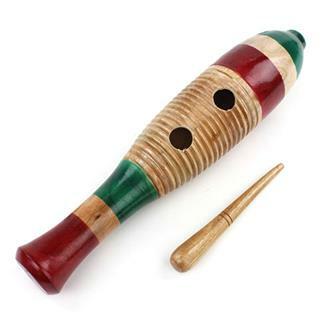 Great, fun, Fair Trade percussion instrument. 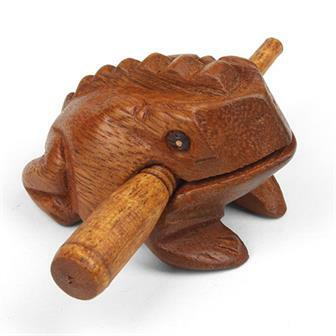 This carved wooden frog güiro is made from acacia wood in northern Thailand. Run the provided stick along the ridges on its back from rear to front to make it croak, or hit it on the head to make a ‘pock’ sound. 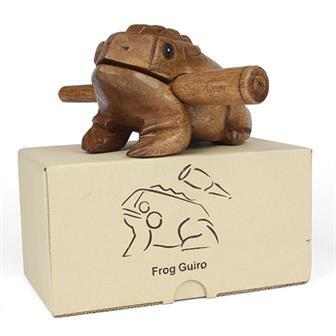 Good sized frog guiro in a natural wood finish. 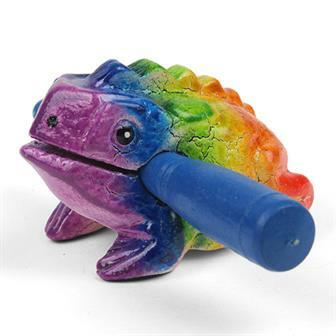 Excellent quality percussive instrument with a deep croaking sound. Run the provided stick along the ridges on it's back from rear to front to make it croak, or hit it on the head to make a ‘pock’ sound. Handmade in northern Thailand from acacia wood. Small but mighty Fair Trade percussion instrument. 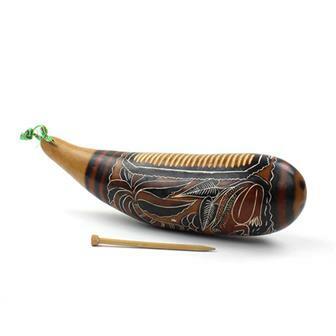 This brightly coloured carved wooden mini frog güiro is handmade and is produced using a method of painting that produces a wonderful 'cracked' effect on the instrument which is very aesthetically pleasing. 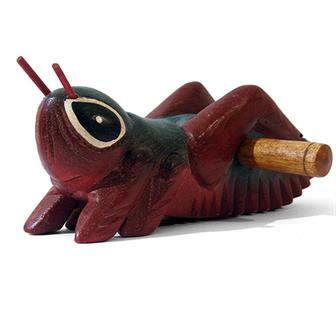 Cute and effective güiro which creates the 'chirrup' sound of a cheerful grasshopper in the summertime. Simply run the striker along the notched legs to make the sound. 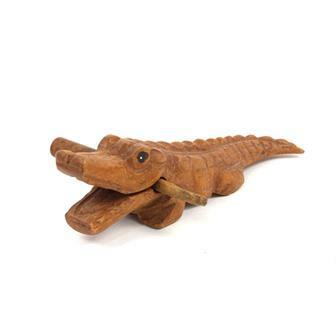 Snappy little carved wooden Güiro in the shape of a cute little crocodile, this little musical instrument in made from acacia wood in Northern Thailand. This item has been designed to provide two instruments for the price of one. 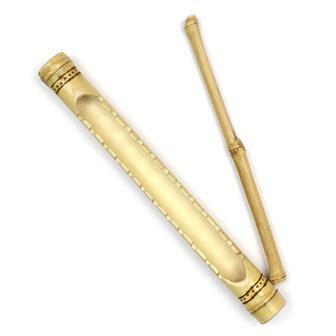 Firstly, the bamboo tube is filled with small stones to create an excellent shaker. Secondly, the bamboo has been hand carved into shallow ridges to make a great sounding guiro. 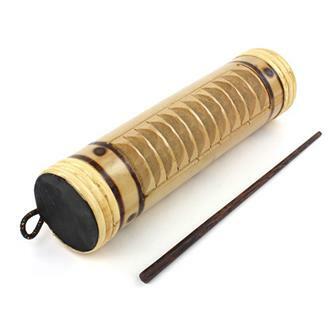 Made from a slice of think bamboo this rustic guiro has satisfyingly chunky ridges which produce a rich, percussive noise when rubbed with the attached striker. Simple but effective güiros made from a ridged section of bamboo and finished with pyrography patterns. This larger sized guiro has been fashioned from a hollowed out gourd. 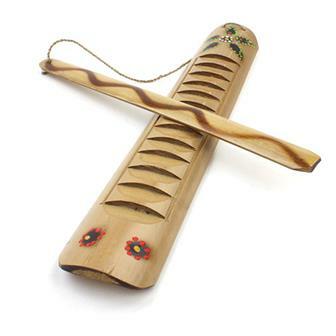 The instrument creates a delightful scraping percussive tone when the player rubs the provided striker along the carved grooves.The instrument has also been carefully hand decorated by skilled Peruvian artisans. Inspired by traditional Mexican guiros, this fantastic instrument creates a wonderful scraping sound with its hollow body resonating chamber. The instrument also features decorative detailing and a glossy paintjob evocative of the Mexican flag. Cute little seed scrapper from Indonesia, this large seed has had several notches etched across the side and has been painted with a pair of eyes.